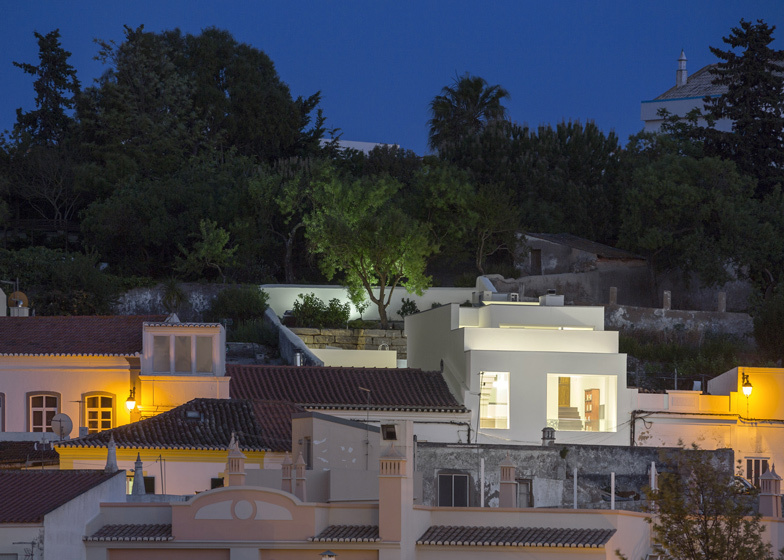 This house by architect Marlene Uldschmidt has been built into the side of a hill in Portugal and features a vertical light well that links its upper and lower floors (+ slideshow). 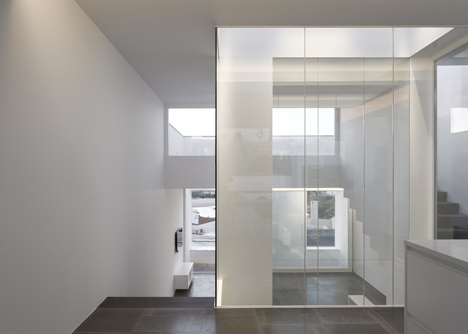 Located in the fishing village of Ferragudo, the split-level building was designed by Portuguese studio Marlene Uldschmidt Architects with layers of internal and external glass partitions that allow natural light through each of the rooms. 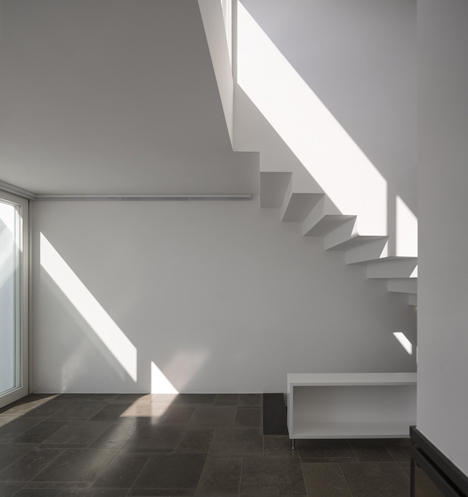 Interior and exterior staircases link the different levels of the sloping site, leading down from a staggered rear terrace to the two main floors of the house, and then further down to the entrance at street level. "The difficult topography of the site meant that our concept would need to allow for the design of the internal space to strengthen the visual connection with the rest of the village and beyond," said architect Marlene Uldschmidt. 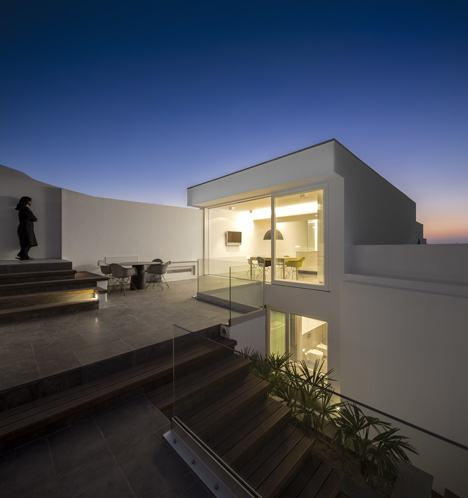 Built on a narrow rectangular site, the glass, stone and wooden house is squeezed between a pair of neighbouring buildings on the hillside street. "The challenge was to create a facade which would be a physical barrier between the public and private areas whilst enhancing the visual connection with the village and the river," added the architect. A small wooden door at street level leads into a long entrance hall on the ground floor, then through to the spacious master bedroom and the only two bathrooms in the house. 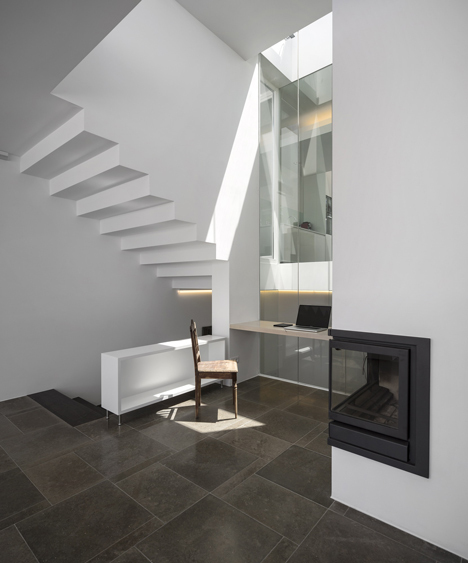 A flight of white stairs appears to grow out from the surface of one of the walls, leading to first-floor kitchen, dining and living room spaces. 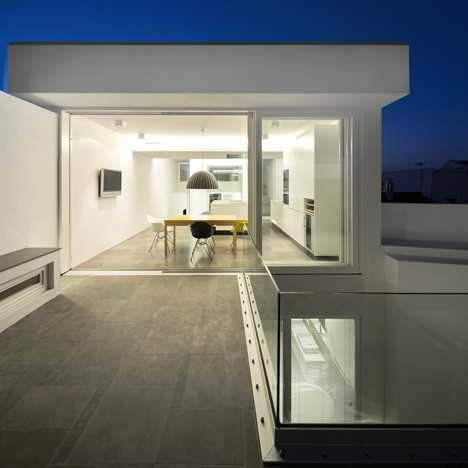 The upstairs kitchen and dining area opens out to the rear terrace, which steps up to various gardens and patios. 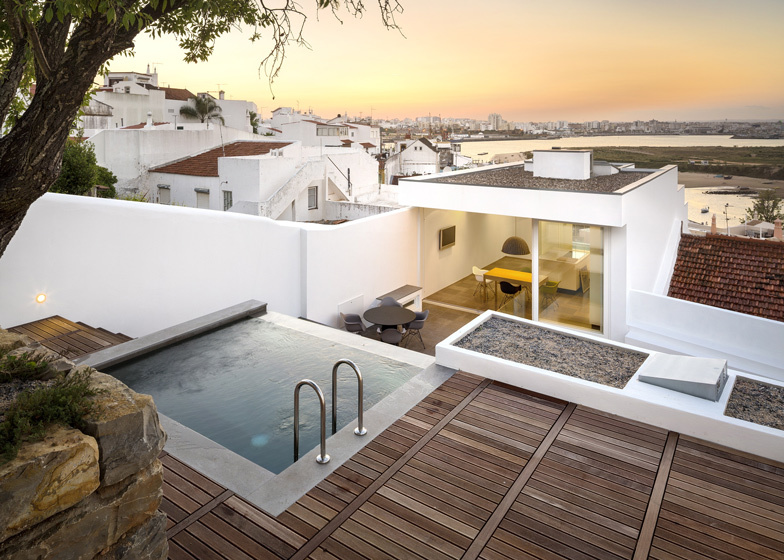 A rectangular swimming pool, wooden sun deck and a private solarium complete this garden. Other Portuguese houses featured on Dezeen include a weekend retreat created from farm buildings and animal pens, a house with its rooftop extended into the hillside and a home with a long stone wall and a folding timber facade. 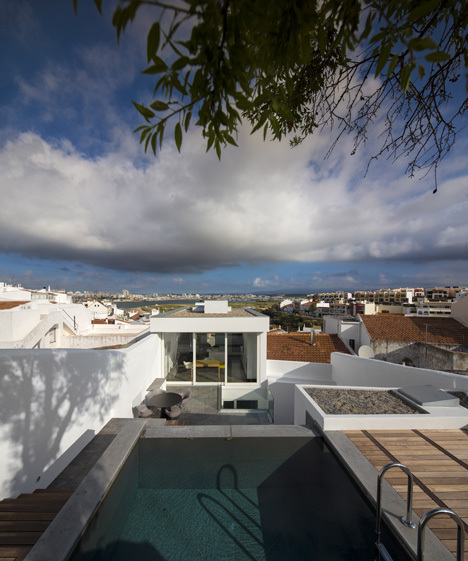 Our studio were excited to take on such an interesting project in the Fishing Village of Ferragudo, Portugal. 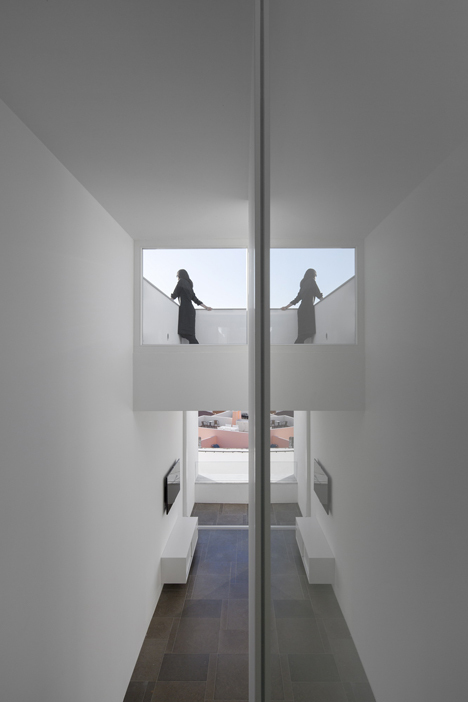 The historic centre of Ferragudo is an extremely sensitive area to work in and we believed that our intervention should be balanced harmonious and above all integrate with the surrounding architecture and history. The studio decided to explore the concept of “LIVING BEHIND THE WALL” ! connection. The challenge was to create a facade which would be a physical barrier between the public and private areas whilst enhancing the visual connection with the village and the river levels. The difficult topography of the site meant that our concept would need to allow for the design of the internal space to strengthen their visual connection with the rest of the village and beyond. 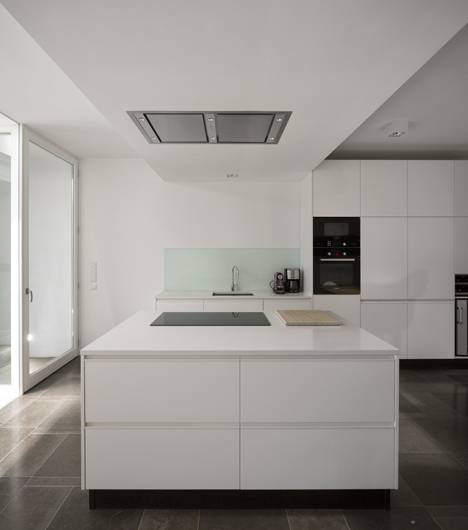 The concept we chose was to use the changes of level within the site in order to achieve this goal. 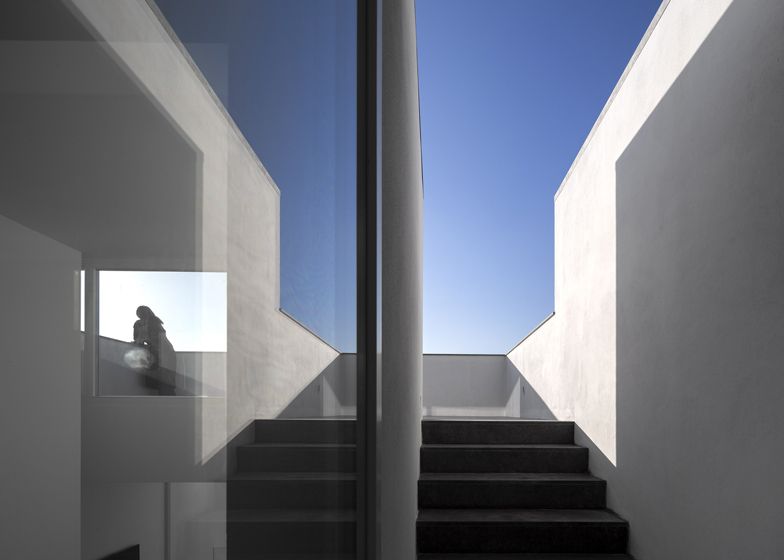 Another challenge of this concept was to create a light and airy feeling within the building. We created a vertical well of light that links all levels to achieve this. 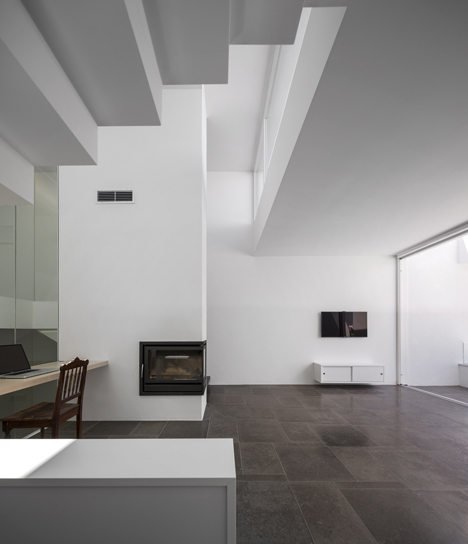 In order to balance the simple white walls natural materials of wood and stone in earthy tones were chosen.